The 'F' Factor - OFFSIDE ! That quote sounded like aforfeit already, although half of the match still remained. 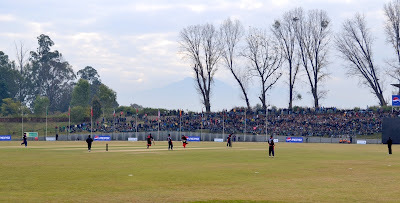 Indeed, the size ofthe crowd at the Tribhuvan University Cricket Ground was many folds that thevisiting team had ever seen. And they were vociferous too, making it very clearwhom they supported. Every delivery that Lakpa Lama tweaked, every ball BinodDas swung, were cheered and made even more difficult to face for the batsmen.For they all came with a roaring noise in the background. And the Malaysianteam succumbed, handing Roy Dias and his wards the biggest trophy for Nepaltill then. That is what fans can do. Maketheir heroes look larger than life, turn them into invincible beings. Theclapping hands and roar can create doubts in the opponents’ mind, making themfalter at the slightest opportunity. 2011: A decade has passed andNepal stands at another crossroads. There is a change in the team, thein-charge is different. New Coach Pubudu Dassanayake is definitely a breed thatthe previous coach was not. The players have grown up, and are not slaves toteenagers’ anxiety anymore. And together they are working to modernize theirapproach to cricket. They are ready to turn a corner. But the fans are the same. Theystill want the trophy. They still want their players to play like invincibles.They still are ready to back their team, with their claps, with their roars andquite possibly, with their aggression. Sports watchers, across theworld, have a sense of solidarity with their teams. While watching sport, theirblood pressure rises, just like the players, and you can see them yelling evenat the television screen at home. Crowded by identical beings, their behavioron the ground can go awry at times. Here, we’ve seen the best of thefan factor; we’ve also seen the worst of it. We’ve seen them queuing up forautographs; we’ve also seen them invading the pitch. Fans, as they are biased, can bea double edged sword. They can kill for you, and sometimes they can get youkilled. For every cricket enthusiast, it would be wise to remember the incidentof February last year and the embarrassment it caused us internationally. Thepitch invasion by the crowd during Nepal’s match against US in ICC World LeagueDivision 5, would always remain as a dark spot in Nepali cricket. As the matchwas disrupted, Nepali cricket was shamed. ICC, following its own investigation,slapped a conditional ban on hosting matches at the Tribhuvan UniversityGround. None, who love cricket in thecountry, would want a repeat. And for that, the onus is on the spectatorsthemselves. They don’t want to be taken as a bad host. For that, they have toprove that they’ve matured, just as their players have over the years. Theyneed to ensure that the opponent team has to be respected, even if they don’treceive moral support. After all, they’re also trying to prove themselves, as muchas our team does. And the day fans start beingjust, nobody can stop cricket development in the country. Not even politicalinterference.